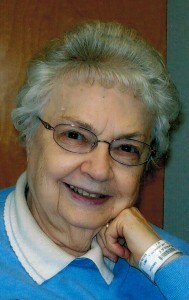 Paula E. Hutchings, 90, of Warren, PA died Tuesday, June 19, 2012 in Warren Manor following an extended illness. Born February 20, 1922 in Penfield, NY to the late Joseph and Lena Wagner Newman, she had resided in the Warren area most of her life. She had been employed as an LPN. A minister’s wife, Paula was a former member of the First Baptist Church until its closing. There she was active with the Mission Group, Women’s Circle and Bible Study. She enjoyed activities at the Warren Senior Center. Paula’s great passion and source of joy was always her family. She devoted her life to caring for her husband during his lengthy illness. She lovingly raised her family and leaves all of them with cherished memories of the most loving, caring, and selfless mom, grandma, and great-grandma that anyone could ever have. As a person of deep and abiding faith, she is now at peace with her Lord and Savior and that gives comfort to her family and friends. -“She was our angel and our rock”. Paula is survived by a daughter – Barbara Hallock and her husband, Terry of Warren; Two sons – Richard Hutchings and his wife, Kathleen of Garland, TX and Robert Hutchings of Mesquite, TX; Six grandchildren and four great grandchildren. In addition to her parents, she was preceded in death by her husband – Rev. Robert M. Hutchings, whom she married July 31, 1943 at Colgate- Rochester Seminary in Rochester, NY; and two sisters. Friends may call at the Donald E. Lewis Funeral Home, Inc. 304 East St. Warren, PA 16365 at 10:00AM Friday, June 22, 2012 until 11:00AM, when a funeral service will be conducted with Rev. Marcus Briggs, Chaplain of Warren General Hospital, officiating. Interment will follow in Warren County Memorial Park. Memorial contributions may be directed to the charity of choice. Online condolences may be offered to the family at www.lewisfuneralhomeinc.com. The family would like to thank Carol Bletcher, Ellen Ruffalo and the Hospice of Warren County for their help and support. My thoughts and prayers are with Barb, Terry, Stacey, Scott, Dan, & family. Paula was such a sweet lady. You liked her right when you met her. You were all very blessed to have her as a mother and grandmother. I know that she is in heaven now smiling down at all of you. God Bless.